Boosting confidence and a new perspective about what tech is. That’s the key to getting more women to choose a career path in tech, according to Kathryn Parsons. Parsons, the CEO and co-founder of London-based start-up Decoded, is here to spread her gospel and get the world – not least women – into coding. “We believe it is a journey, and the first step is the hardest,” she told Project Ada. Kathryn Parsons says that she wants to reframe the world’s idea of what tech is. She describes going into classrooms of 17 year-old girls, and asking who thought of themselves as brilliant coders. Decoded was founded in 2011, and has now gone bi-continental, with the New York offices soon to celebrate their first birthday. Having studied languages at university, Kathryn Parsons herself comes from an entrepreneurial background, rather than from the tech world. Most of the Decoded staff are also self-taught coders who used to work with something else. But Kathryn Parsons doesn’t see that as a problem. “We’re all passionate evangelists. We want to communicate skills. Tech can often talk only to tech, not to the rest of the world. It can feel quite exclusive,” she said. That exclusive feel may go some way towards explaining the lack of women working in the tech industry. The percentage of women in the workplace is not just low – but actually dropping, from 22% in 2001 to 17% in 2011. “The stats are pretty awful,” she agreed. 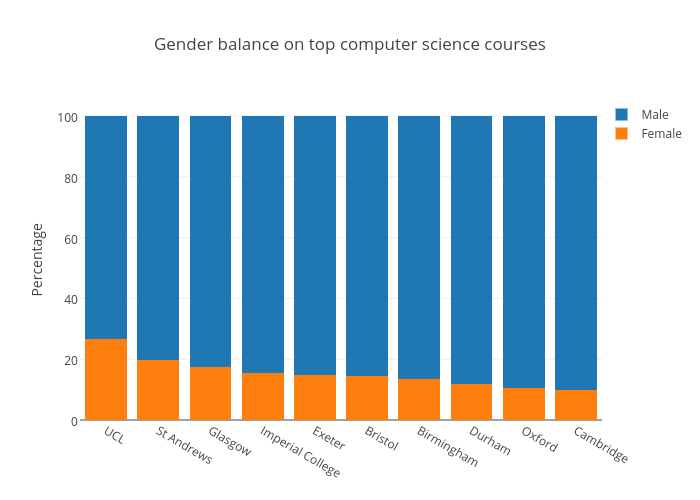 Among Decoded participants, who are pretty equally split among men and women, there’s no difference between genders in aptitude for programming, according to Kathryn Parsons. “The difference is a huge lack of confidence among women,” she said. Unsurprising, perhaps, considering the sexist attitudes that still abound about women and technology. How can playing cards combat gender inequality? Can playing cards help combat gender inequality in tech? The internet certainly seems to feel that way, as a Kickstarter campaign to make card decks promoting promoting women in computing raised over $15,000 from over 350 backers. Jessica Dickinson Goodman, one of the card deck’s creators, was overwhelmed by the response. “I knew something special was happening when we reached that $3,000 goal in the first 2 days. We’re now at 400% of funding and climbing,” she told Project Ada on Friday. In its last 24 hours, the Kickstarter campaign raised another $1,000 to land on just over $15,000. The idea is to promote the many women who’ve been leaders in computer science, from Project Ada’s own namesake Ada Lovelace, to Grace Hopper, inventor of the first compiler for programming languages – and credited with the term ‘debugging’. According to the creators, no enough of women’s contributions to the tech industry are remembered. The card deck is a way to promote role models for today and tomorrow’s women in computing. “When I was a little girl, my Mom gave me a deck of cards with names and stories of women who fought in the American Civil War. I played a lot of Hearts and Poker growing up, and those cards were a constant reminder that women change history,” Jessica Dickinson Goodman said. She created the card decks along with her mother Katy Dickinson, and sponsors Everwise and Duke University. The Kickstarter campaign was launched to get the playing cards into their second edition – and in less than a month has already quadrupled its goal of $3,000. The back of every card includes the text ‘Keep our history: Create or expand a Wikipedia page for a notable woman in computing.’ Indeed, getting more women onto Wikipedia was an important goal for the creators. Less than 1 in 10 Wikipedia editors are female, a 2011 survey from the Wikimedia Foundation showed, and the gender gap hasn’t closed since. “I figure if Donald Trump has 12,000 words dedicated to him on Wikipedia then Chieko Asakawa, a leader in accessibility research and a role-model in the visually impaired technical community, deserves at least as many,” Jessica Dickinson Goodman said. ►Read more about all the women included here.